Hello all! Thank you to everyone who made it out to the Pearl Art Gallery on December 3rd. There were many beautiful works of art on display from sculptures, to furniture, to jewelry and paintings. Next month, we'll be holding Green Drinks in another artful location, the Philbrook Museum of Art. Brian Franklin, Owner of Double Shot Coffee Company (DSCC), will be our guest speaker. DSCC quite possibly serves the best cuppa joe in town. Of course that's a matter of opinion - I guess that means you know mine! It's roasted onsite in a restored 1953 Vittoria and only the best beans are used. Those beans and their procurement will be the subject of our event. Coffee that has been acquired according to what is morally right and fair. Coffee that has been grown and picked by the sweat of a man’s brow and paid for by the sweat of my brow and the sweat of your brow. That’s what I want. I want to treat the farmer as I expect you to treat me: with respect and the understanding that my time is as valuable as yours. And the farmer’s time and the picker’s time is every bit as valuable as ours. How to achieve this is a tricky proposition. Coffee is a volatile (and precious and important and delicious) agricultural product. The further I get into the industry and the more I learn, I’m continually astounded by how fleeting and inconsistent COFFEE (as a whole) is. The taste and quality of coffee is determined by a host of factors working together, including growing conditions, elevation, rainfall, soil quality, variety of plant, techniques for cultivation, ripeness of coffee cherries, processing techniques, luck, sorting, passage of time, shipping and storage techniques, roasting profile and level of roast, freshness, grinder type (and maintenance and sharpness of burrs and grind fineness), brewing technique, water temp, brew time, drinking vessel... and a host of things I don’t know about and may not understand even if I did. What I’m trying to say is, there are a million things that can go wrong along the way to ruin a cup of coffee and a million things that need to go right in order to get a good cup. Lest you think there is any standard way of doing ANY of this, think about the 70 or so countries that produce coffee and the hundreds of countries that drink it, not to mention the scores of coffee shops in each town. None of them do things the same. On top of that, coffee ages. Even in the dried, green (pre-roasted) form that I have in bags in my store. I’ve found that some coffees that turn exceptional at some point in time only stay in that “perfect” state for a couple weeks. It’s fleeting. That’s why I always say, when you taste an amazing cup of coffee, you should stop and appreciate it because it may never be this way again. So why, when you have an unbelievable cup of coffee, does it come so inexpensively? With all the care that goes into that cup and all that could’ve gone wrong, how can it possibly be so cheap? Someone is getting the short end of the stick. It’s hard to generalize in the coffee industry because, as I mentioned, nothing is standard, but I’m going to make one general statement: Coffee farmers work hard and earn little. Most people don’t want to know about this, and don’t have to face it. It’s easy to drink your coffee in ignorance. Easy to buy coffee with marketing certifications that sound ethical and make you feel good about your purchase. Easy to complain about the price of a cup or a pound without ever considering all the work of all the people who put their hands in it. And you don’t have to think about that stuff. But I do." I'll let you visit the site to learn more for yourself an finish reading. For anyone who says that Oklahoma's got it all wrong, they should take a closer look at the resources that we've got to offer, right here in our own backyard. December Green Drinks - "Happy Merry New Art"
Season's Greetings! Here's hoping that everyone had a lovely Thanksgiving and lots of delicious free range local organic turkey! This month we'll be celebrating Green Drinks at The Pearl Art Gallery on Thursday December 3rd from 5-8pm at 1201 East 3rd Street, Tulsa, OK 74120. The gallery carries fine art, handmade masks, sculpture, jewelry, and art glass. Come and enjoy their new collection during the opening. Complimentary wine and hors d'oeurves will be served. Also, mark your calendars for January 14th, 2010. Green Drinks will be held at the Philbrook Museum of Art. Brian Franklin, owner of Double Shot Coffee Company at 18th and Boston, will be our guest speaker. During his presentation we will learn how Brian sources his coffee and what he does to support the growers, pickers, farmers, and communities that provide it. You won't want to miss it!! Admission is free, but you'll need to pick up your free pass at Double Shot, 1730b South Boston Ave, after December 3rd. This month we'll be gathering at the White Owl on Cherry St at 5:30 on November 11. We'll listen to guest speaker Les Pace, from the Oklahoma Green Schools Committee http://okgreenschools.org/index.php, give a brief presentation on the newly installed wind turbine at the HelmZar Challenge Course, a Tulsa Public Schools Property. The 30 ft tall turbine generates 10 amps, enough to power the lights in the classroom at the facility. 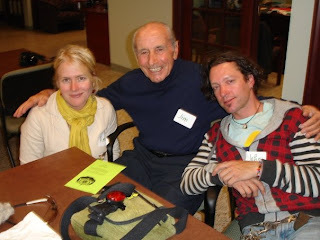 -Some green schools are built on the same budget as conventional schools. -Market-wide energy cost savings represent an important benefit often not included in energy efficiency financial analyses. -There is a large body of research linking health and productivity with specific building design attributes. -17 separate studies all found positive health impacts from improved indoor air quality, ranging from 13.5% up to 87% improvement. -Good lighting “improves tests scores, reduces off-task behavior, and plays a significant role in the achievement of students. -Greening school design is extraordinarily cost-effective compared with other available measures to enhance student performance. -A recent review of five separate studies found an average asthmas reduction of 38.5% in buildings with improved air quality. -Greening public schools creates an opportunity to improve the health and educational settings for all students. -The financial benefits of greening schools are about $70 per ft2, more than 20 times as high as the cost of going green. -Greening schools today is extremely cost-effective, and represents a fiscally far better design choice. This will be a great opportunity to learn about the initiatives in Green Country that are bringing sustainability to our community and future generations. Join us for drinks, networking, and fun. There was a great turnout last month. 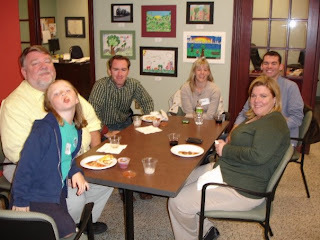 Up With Trees recruited new volunteers and Tulsans were able to learn more about UWT, Sustainable Green Country, & the US Green Building Council while free pizza and wine were enjoyed by all. If you weren't able to join, but would still like to acquire FREE, that's right FREE, trees for your business, non profit, or personal property, contact Up With Trees today!! http://www.upwithtrees.org A HUGE thank you to Joe Mommas for the donation!! Lastly, look for updates from December and January as we have exciting events at the Pearl Art Gallery and Phillbrook. Stay tuned!! Free Trees for Non-profits, Agencies and Individuals are here! Ahhhh fall. The leaves are starting to turn, the air has become chilly, and the evenings are getting shorter. I love this time of year. How fitting that as the season turns, and our trees provide us with nature's ever changing canvas, we gather to learn about our urban forest! This month we have something really cool in store. Wednesday October 14th, we'll meet at Up With Trees newly renovated building & educational center. Executive Director, Anna America, will give a brief presentation on the many programs Up With Trees is offering - just in time for planting season! Up With Trees is a non-profit organization committed to planting, preserving and promoting Tulsa’s urban forest. With the generous support of volunteers and donors, they plant trees along streets and trails, neighborhoods, firestations, parks and schools. You are welcome to tour the new space, learn why their signs are REALLY made of wood, & find out how you can get involved in tending Tulsa's urban forest. You'll also find lots of friendly people mingling, networking & enjoying complimentary wine, provided by Up With Trees, and food, provided by Joe Mommas. So mark it on your calendar, bring a friend (or three), and enjoy yourself... that's the point! Where: Up With Trees Building & Educational Center -- 1102 S. Boston Ave.
Why: Because being sustainable has never been so much fun! 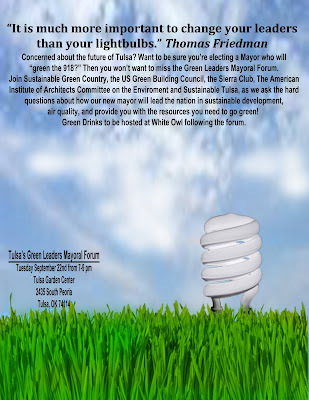 The US Green Building Council's Tulsa Chapter will now be holding their monthly meetings along with Green Drinks. The gatherings are the same, but have a new element. If you are already a member of USGBC or are in the industry and would like to become more involved, this is a great way to meet all the right people. Other common Green Drinks attendees are members of Sustainable Green Country, the Sierra Club, Tulsa Young Professionals, Sustainable Tulsa, State Representatives, workin' folks, stay at home moms, farmers, local business owners....yep, pretty much anyone who wants to be a part of Tulsa's progressive population. In addition to Green Drinks on October 14th, Up With Trees will be hosting "Trees I Have Known" Tree Walk from 9am-10am at the Tulsa Arboretum 2445 South Peoria in Tulsa. The Arboretum is in the Woodward Park complex, right by the Tulsa Historical Society and the Linnaeus Teaching Gardens. This should prove to be an entertaining and enjoyable morning activity. If you're free, please join in! 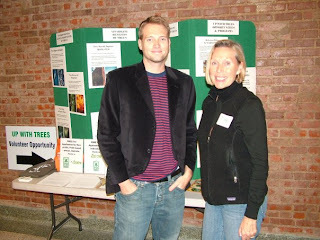 Lastly, without the generous donations of our sponsors, Green Drinks would not be able to hold these type of events. This month we will begin accepting donations at the door. Please consider contributing so that we can continue to provide you and our community with learning and networking opportunities. The next Green Drinks is August 12, 5:30pm, at the Elote at 514 South Boston Avenue in Downtown Tulsa. See you there! Hello Summer! It's July and we're less than a week from the next Green Drinks. We're meeting at Elote once again. It's hot outside. Libby has mojitos and margaritas to help your cool your heels while you mingle with your fellow colleagues, artists, teachers, students, volunteers, TYPros, neighbors, friends.....you get my drift. All are welcome to join us at 5:30 on July 8th at 514 S Boston in Downtown Tulsa. On another note, I wanted to share some pictures from my one of my favorite activities during Local Foods Week which was June 14-21st. 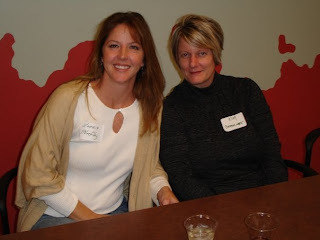 (If you missed out, no worries, there's still plenty of fun stuff going on throughout 2009) My mother, aunt, and I visited The Living Kitchen in Bristow for a Farm to Table Dinner (and it was my birthday - what a treat). Lisa Becklund, a Seattle native, owns this 7 acre farm where they raise goats, chickens, a llama, and lots and lots of veggies. You can find her or Kasey at the Cherry Street Farmers Market on Saturdays where you can purchase a variety of delicious goat cheeses and produce. You could also enjoy one of their fabulous (really - fabulous!!!) dinners on the farm. 30 minutes outside of Tulsa you will get a tour, drinks and a four course dinner. At the close of our dinner, excuse me - fabulous dinner, Lisa shared with us that the only ingredients which were not from her farm or her neighbors farms were the salt, olive oil, and coffee!! Another great turnout for Green Drinks at Elote in June. There was a lot of excitement about Local Foods Week! Sustainable Green Country had lots of activities to choose from. If you missed out, be sure to come to Next month's meet up so you can get up to speed! 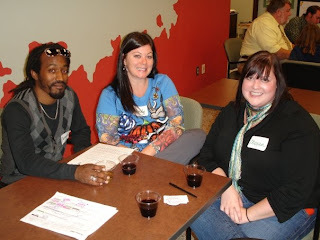 Due to a scheduling conflict we'll be moving the location of Green Drinks for July's meet up. Check the blog for an update in the near future! Elote is quite possibly Tulsa's greenest restaurant. How? All meats are organically grain fed and raised in Bixby, fryer oil is recycled to make bio-diesel, printing is done on 100% recycled paper, and produce remnants are composted and used on Three Springs Farm who supplies the restaurant! 1. Locally raised food travels fewer miles than food from outside sources. This uses less fossil fuels, thus lowering our carbon footprint. 2. By supporting local farmers (vs Concentrated Animal Feeding Operations (CAFOs), agricultural conglomerates, imported produce, etc) you are keeping your dollars within your local community instead of sending it to the supermarket chain headquarters. 3. Meet your farmer. You know all those videos and articles about environmental degradation, chemical additives, pesticides, and animal cruelty that we prefer not to read because ignorance is bliss? That can be taken out of the equation when buying from local farmers who raise free range chickens, grass fed beef, and organic produce. They can tell you about their practices and may even offer a farm tour for those in doubt. 4. Nutrition. Local providers not only bring us fresher foods, but they provide a wealth of options that you might not find in your corporate supermarket. AND the fresher the food, the better the nutritional value. More than likely that tomato or banana has travelled thousands of miles since it was harvested, labeled, and put on the shelf. By the time it gets to you plate, there's not a lot of nutritional bang for you buck. 5. And the most important reason?? IT TASTES BETTER! Many conventionally produced vegetables are hybridized to ship well in boxes, not to taste better. Grass fed beef tastes better than grain fed - feed lot cattle. Fresh baked bread, locally crafted artisan cheese, organic strawberries - need I explain?? So how do you get the most out of Local Foods Week? One way would be to attend Salsafest!!! Salsafest is a free outdoor festival from 4-9pm on June19th at the Chapman Centennial Green Park. There will be live Salsa music, Salsa dancing lessons, children’s activities, local art booths, a chili pepper eating contest (to see who can handle the heat), a salsa tasting and salsa-making contest. All proceeds from the event benefit Sustainable Tulsa. Sustainable Tulsa is a grassroots, non-profit organization dedicated to responsible economic growth, environmental stewardship and quality of life for all. The festival is focused on bringing families downtown and to bring awareness to local foods. Do you have an award winning salsa recipe? Enter and find out. Each salsa contest participant is asked to use at least one local ingredient in their salsa. Salsafest will provide each participant with an eight-foot table and tablecloth. Salsafest will also provide 250, 2oz ramekins and lids for the contestant’s salsa to be put in. We ask that participants send the salsa and one or more representatives of the salsa to the festival no later then 3:30 on June 19th. They will be expected to stay with the salsa until it is gone (no later then 9:00 pm). After that participants may clean their table and join the party. Participants may bring promotional materials to help market their business and salsa. In addition all Salsafest participants will be recognized on the 2009 Salsafest T-shirt. will submit a ballot. When all ballots are submitted, votes will be counted and the Tasters Choice salsa trophy will be given out. There will also be a judging by local food celebrities including Scott Cherry, Tulsa World food critic. The Celebrities Choice Award will be given out at the same time. All that being said, I hope you didn't forget about Green Drinks itself!! We'll see you on June 10th at Elote. More details to come on Local Foods week very soon, stay tuned!! In July we'll be meeting at Center 1 Market on Brookside, more details to follow. Greetings! 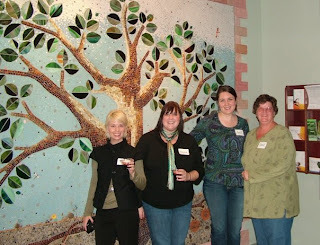 Thanks to everyone who came out and mingled during Tulsa Green Drinks last night at the White Owl. We had almost 30 people in attendance!!! Our crowd filled the 2nd floor until around 7:30 or so. We handed out surveys for Planit Tulsa's initiative to choose a scenario for future development (http://www.planittulsa.org/) If you have not visited the website to submit your response, please do so!!! And for those of you who took them home, they can be dropped at any Tulsa Library location. 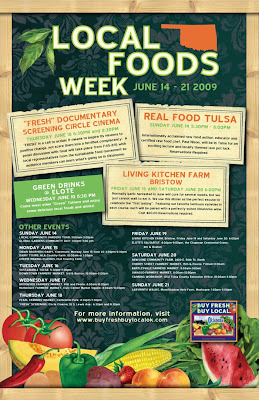 The 2009 Buy Fresh Buy Local guides, provided by Sustainable Green Country (SGC), were also distributed. The Farmers Market season is in full swing. Have you made it out yet? Click on the links to the right of these posts to find out more info on how you can support your local farmers and find better yummier food! During the SGC Council meeting (held at last night's event) we discussed the exciting plans for Local Food Week which will be held June 14th-21st. Stay tuned for more details! Included in the crowd were friends from TYPros Sustainability Crew, The City of Tulsa, Tulsa's Green Building Council, Sustainable Green Country, Buy Local Tulsa (http://www.buylocaltulsa.com/), ICF International, Real Food Tulsa (http://www.realfoodtulsa.blogspot.com/), and host of others. This is truly a great way to meet your fellow progressives in the Tulsa area!!!! Thanks again to everyone who came out. See you next month!